Craig Rapihana used life jackets as floats until he decided it was time for a better alternative. The result is Lazy Bunz, a streamlined water lounger that’s simple and comfortable. Craig, a former rugby player from New Zealand, loves beaches and boating. His idea for Lazy Bunz was to create a saddle-like float that would contour to bodies of all shapes and sizes. Simply straddle the float and sit on it, and Lazy Bunz will keep you bobbing up and down in the water. Your hands are free, your feet are off the ground, and you’re upright -- a prime position for chilling out and enjoying the water without feeling like you’re about to topple off an unsteady float. Lazy Bunz is made in the U.S., and it’s perfect for summer days at the ocean, lake or pool. It’s lightweight and easy to transport, so you can float wherever you swim. Are you ready to bob? 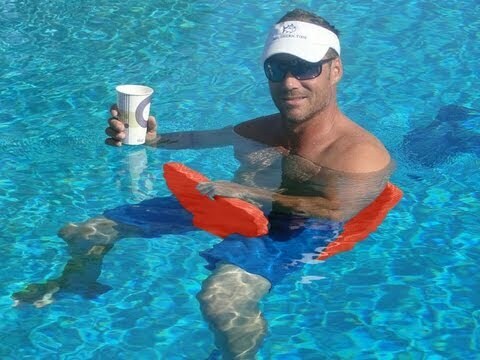 Whether at the pool, boat or beach Lazy Bunz provides a unique and practical solution to do something we all love to do. Get ready for the Lazy Lifestyle this summer! I LOVE this idea. As someone who spent her summers sailing in lakes and on the ocean, relaxing in the pool after was part of the 'routine.' I'm quite surprised at the pricing; seems really high for what it is. Too expensive for my budget. If the price ever comes down to $25-30, I'll definitely purchase a couple. Good luck with the launch. @Jean I agree - $45 is just a little too much for even a really cool pool float. Agreed- $45 is a bit steep, but the alternative might be awkward in a pool noodle between the legs..lol. @Jean Hi Jean, Aaron from the Grommet here. Thrilled to hear of your memorable summer activities and glad you like the idea. Thank you for sharing! You're right that the price is a bit higher, relative to comparable products, but it is so largely because they have focused on quality, working with a superb US manufacturer which is the leader of water floats in the world. Thank you for the well wishes and have a wonderful Friday! @Aaron Hi Aaron. Because the product is supposed to be high quality, what kind of guarantee is provided. I am interested in purchasing for a family member who always tries to by USA-made, but at the root, this product is still a pool float which will be in the sun and a chlorinated pool daily in the summer. Having some kind of guarantee or replacement plan would be helpful before shelling out almost $50 for a one person pool float. @Sarah Hi Sarah. We don't currently offer any guarantees on the product because the only thing we could warranty would be it's cosmetic appearance and that's hard to define. That being said, I've owned products from our manufacturer in the past, had them exposed to the Florida sun for 15 years they still held up -- albeit they didn't look pretty. A reasonable lifetime for these floats to maintain their integrity and appearance would be 5-7 years in my opinion. 5-7 years for a pool float is excellent. I hope that helps and I will work on providing a reasonable warranty program if I can better define it. @Chris Juall, Co-Founder If you offered one at half the cost to make to bring the price down I believe you will have return customers every year. There are a lot of people that will lose them, leave them, gift them or just want to replace the one from last year. You say they last 5-7 years still functional but not as pretty. I suggested making them last 2-5 years and changing the shape and color and or patterns every other year. Great idea. Looks like good quality. Price is out of line with competitive products. Put it on sale at a launch-price of 10-15 lower and I'd buy several. Good Luck. @Gail G I agree. It's time for me to replace several pool items bought 5-6 years ago. I thought a few of these would be suitable replacements, but this price is way out of line. I like to give new products a try, but I don't throw money away. Great idea! I'm sure if I used this at our beach several neighbors would buy one too, but not at this price! Please let us know if you lower the price; $30 or so would be fine. I use a $1 noodle to sit on in the pool or at the beach. I certainly love the idea and for $15 I'd go for it, but $45?? Really?? Not a chance! Make it affordable, please! @Bobbi Hi Bobbi. Thanks for your comment. Our product is an entirely different product from a noodle. I wish we could be a BMW for the price of a Kia but we can't. So much goes into it, closed cell foam, durable, vinyl coating, hundreds of employees, tremendous shipping logistics, environmental compliance, etc. Hopefully, you'll be able to experience one soon at one of the many resorts that are buying them to rent or use for their guests. @Chris Juall, Co-Founder am sorry, as a former warehouse manager there are to many programs out there to solve any and all shipping issues. Hundreds of employees, what else are you making that this one product is supporting all the others. American made does not mean most expensive, European vs Asian in the cars, check the wages for the 2 areas, that is why BMW is so high, plus they can get it, it is a well made car, but am sorry not worth the price for mass produced. Hence do not see any positive sides to your price from any of the comments, that should tell you to either drop the price (before you make a killing off the backs of the ones who buy it initially) and sell it at a fair market value, am sure at 50.00 there is plenty of wiggle room. I think this is a great idea and would love to buy several, however, the price is way too high! Reading through the comments, I am in the majority. Hopefully, the founders of Lazy Bunz will read these comments and change the price. I realize they want to make as much money as possible, but sometimes it is best to lower the price and sell more. I can buy a couple of full body pool floats for the price of one of these. Great idea....However, like many others, I agree that the price is high! I have high quality pool lounger type floats that had a comparable cost. If the price were lower I would purchase several for use in the pool and also on the boat! Hi Everyone. Thanks for your comments. I agree that $45 is not inexpensive by any means however, it's the price we have to pay for quality. Our manufacturer is the leading pool float manufacturer in the U.S if not the world and their products can be found in just about ever pool store along with high-end catalogs like Frontgate. Their larger pool loungers cost well over $120. We wanted to keep the prices down in the $29.99 range initially but unfortunately that meant going to Taiwan or China and those products were horrible and surprisingly not as inexpensive as you would think. The good news is once our volume increases we'll be able to lower our costs and those costs can be passed on to you. @Chris Juall, Co-Founder Chris, remember it`s said that you first have to believe and then God will make a miracle? I`t the same with everything. You have to lower the price first and then you`ll get so many orders, you will be making money by the fistful. With so much demand, you won`t have much time if any to lose any money if at all. Breaking even for a couple of weeks, if that, will end up making you more money in the end. Listen to us all potential customers. Nice idea. I have a medical condition which doesn't allow me to spend time in the summer heat. Being able to bob around in a pool would be more fun than leaning and squatting on the sides. However, the price is too much. Perhaps if a discount is offered for buying more than one?? @Deborah Hi Deborah! Great question. It'll float anyone up to 300lbs. The more body fat the easier it is for one to float. The more lean muscle the harder it is. I have many friends who are over 200lbs and some over 250lbs who float great. I hope that helps answer your question. It will be a seller for those who own pool, and boats can afford the price. It looks great, and it stores well that would be the kicker for me if I could afford it! So when the price comes down, like they always do. We will have these in our camping gear because they store so well!! @Audrey Sounds like a plan! It's nice to see that you also have an entrepreneur mind! I love it. Also, I will do my best to make sure these become affordable to everyone over time. @Audrey, Thanks for weighing in a sharing your entrepreneurial experience. 80% of your ideas have come to market? That is a great hit rate. That goes a long way to explaining your more sophisticated understanding of how pricing in new products work. They are rarely able to go out of the gate at mass market prices and it is such a fine balance between creating a price that drives scale (as @Lynn, above) is suggesting, and ensuring that the business itself can be sustained long enough to get to a larger scale. The other commenters are well-intentioned, and Chris is all ears to the feedback. I should have mentioned I am the CEO of The Grommet, in my previous comment! @Jules Good comments. I am that boat person. I am fortunate enough to be able to live at the waters edge on the Sacraramento / San Joaquin River Delta in California. Kids, grandkids and adults have long used the lifejacket "diaper" to float here. This is really a great idea, but at a price point that puts it outside of being practical. Coast Guad approved life jackets start at about half this price. Given the fact these will be purchased in multiples (no one likes to bob alone) I would like to see them sold that way at a more affordable price point. I'd buy four to six if they were around $25-$30 ea/ If packaging them in multiples of 2 to 4 units could reduce the price I think this would be a very popular item. This product looks like the closed cell material used in the really high-end pool floats that sell for $125 or so. Those are durable and have sold well for many years. I wonder if you might offer a "two-fer" deal ... purchase two for $70, for a short period to introduce them. If you would, I'd be your first customer. @Virginia You are exactly right about the high-end costs and durability and I like your thinking about promotion. We'll keep that in mind for our online sales channels. I absolutely love this idea, and plan to purchase. I can't tell you how many life vests and cushions I've used to "float", albeit awkwardly, over the years. I grew up boating and canoeing, and this just makes so much more sense from an ergonomic and safety perspective. As a single mom I am on a budget, but with a young son who loves the water, can see that this will be useful to me for years to come! @Jennifer Glad to hear that Jennifer. I hear you about the life vests and cushions. They did the job but they were not ideal. Lazy Bunz fills that void for sure. I have a 9 yr old and 13 yr old. They love the product and frequently use it. I have read all of the previous comments. In one, you ( the other guy?) said that if this gets going you might drop the price. But by then I will have forgotten all about it,and you would have to spend money to let people know about this great product. Right now, you are getting a lot of exposure to a lot of interested buyers. I agree with the people who suggest that you drop the price for now, and then when people buy them and show them to their friends that surge of advertising would pay for itself. I am more likely to buy something that I see friends using, than to scour catalogs to look for something that I do not even know exists. Please drop the price and let us help us sell them! Looks like a great idea, the price is just not right, would love to get a few if they were more affordable! I love this idea! Price is a bit steep, but I am willing to pay that for a good quality made in the USA product. Two questions, what is the exact size and weight of the float? Can it be packed in a suitcase? We usually pack our life jackets on trips to Hawaii to use as floats in the ocean. @Cyndi The dimensions are approx 36" long, 17" wide and 1.25" thick. Weighs about 1.5lbs-2lbs. It can be packed in a suitcase as long as the suitcase is close to the product dimensions. I wouldn't recommend folding it to a tight fold. Rather, I would opt to keep it as flat as I could so it's not temporarily mis-shaped when it's unpacked. Hope that helps! What a clever idea, it looks very comfortable and I love that it allows your hands to be free! Too bad it's priced so high. Hopefully the price will eventually come down and I'll buy one. In the meantime, I bet I could fashion something similar out of one of the floats, noodles, or life jackets laying around my house! I will have to agree that the price is too high. If they were closer to $30 I would buy two immediately! @ Chris Juall. I can appreciate the time effort and expense of launching this new product and I love buying USA, but not at this price. This is too simple a design no matter the quality, to pay so much. I can go out to my pool house right now and come up with several of these (adapted to fit), from my stash of pool equipment. One of them would not last as long as yours but consider how many I could make for the high price you are charging. Maybe you could sell some to the government. LOL Good luck to your endeavors. @Lane I initially wanted to create a product for $29.99 but that went out the window pretty quick. There's so much more to it than I originally thought. Thanks for the kind words and so far we're off to a great start. I'm a new customer and feel redundant about referencing the price of this float. It's obvious that, even with all the mostly negative comments, you're not willing (or unable) to lower the cost. Perhaps you'd be smarter to run a short video showing the manufacturing and distribution process. If I knew WHY I was paying a premium for an American-made product, it might make a difference. For now, I'll pass. Love the idea, but way too expensive. A noodle will do the same thing when you put it between your legs. Hi~ Is there a weight limit for this float? I imagine there must be. I would consider this a cool gift for my sister, but she is quite heavy. ?? Oops! i just read the specs. 300 lb. limit is awesome! I will order one right now! Love the idea, hate the price. Good luck with your launch. My daughter is a internet entrepeneur and I understand start up costs and narrow margins when manufacturing a quality product in the US. She is unfortunately going to outsource manufacturing in China in order to be priced competatively. It's a shame but that's the reality of the market. For now, I'll stick with the noodle. I really wish I could afford to get one of these!!! I'll take one for $25 and then I'll get pictures of everyone in my family using it in our pool and then I can advertise for you!! I always say be part of solution not part of the problem!!! Call me any time!!! I'm here to help! Craig Rapihana used life jackets as floats until he decided it was time for a better alternative. The result is Lazy Bunz, a streamlined water lounger that’s simple and comfortable. Craig, a former rugby player from New Zealand, loves beaches and boating. 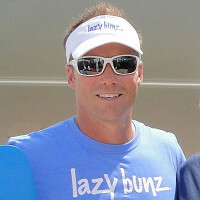 His idea for Lazy Bunz was to create a saddle-like float that would contour to bodies of all shapes and sizes. 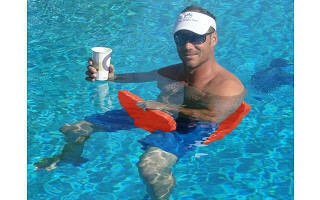 Simply straddle the float and sit on it, and Lazy Bunz will keep you bobbing up and down in the water. Your hands are free, your feet are off the ground, and you’re upright -- a prime position for chilling out and enjoying the water without feeling like you’re about to topple off an unsteady float.